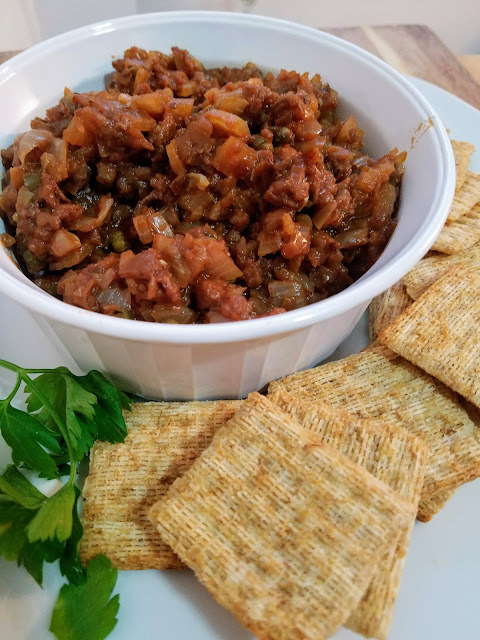 If you're having leftovers today but want to change things up a bit with a new appetizer for you and your guests, try out this Eggplant Caponata with some crackers, leftover bread, or pita chips. It's super easy, healthy, and delicious - my favorite three things! This recipe is from Chef Chloe's Vegan Italian Cookbook. 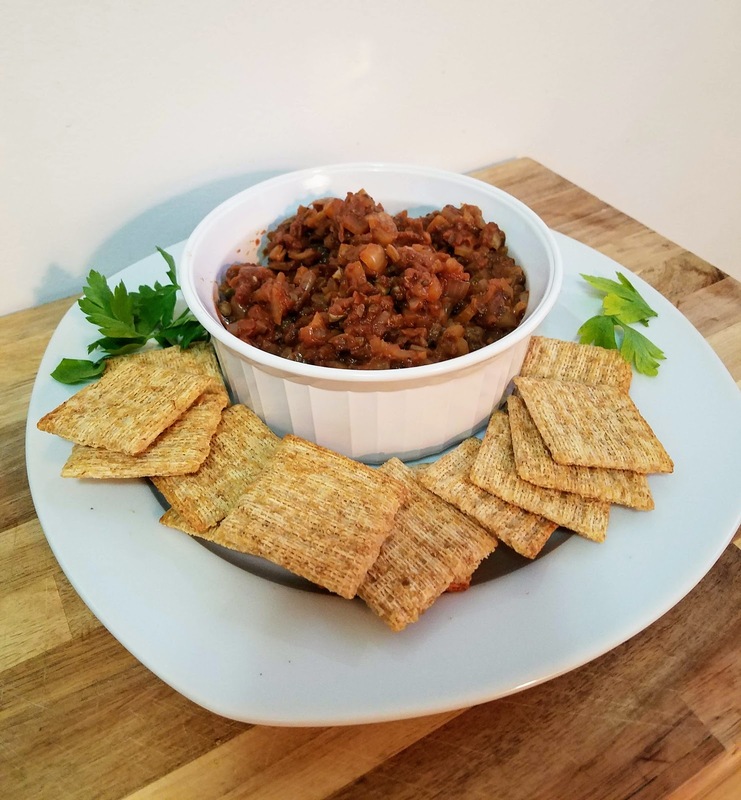 It's a great afternoon snack or appetizer. I like to make it on Sunday afternoons when we are just lazing about and want a little snack before dinner. Preheat oven to 400 degrees. Cut off top of eggplant and then cut in half lengthwise. On the flesh side, make deep diagonal scores with your knife, being careful not to reach the skin, and then again in the other direction, to make a grid pattern. Lightly brush olive oil on the scored flesh and place flesh side down on a baking sheet. Roast for 40 minutes or until the flesh is very tender. Meanwhile, heat a skillet over medium heat with 1 Tbsp olive oil. Add chopped onion and cook until soft, stirring frequently. Add tomato paste and water and cook for 1-2 minutes more. Remove from heat and set aside until eggplant is finished. 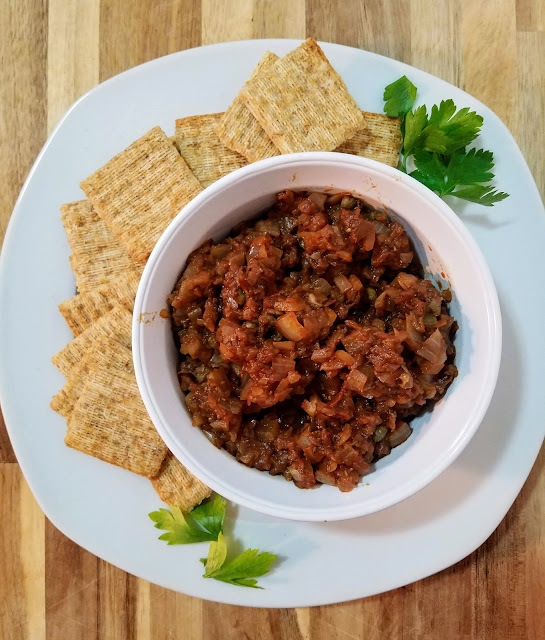 Remove eggplant flesh from skin using a big spoon. 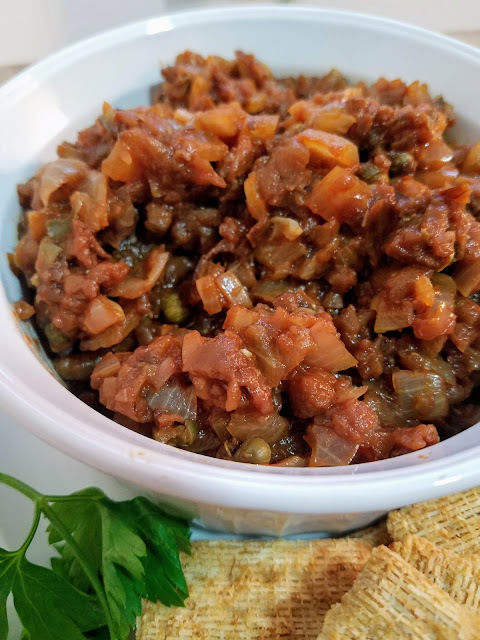 In a food processor, add eggplant, onion mixture, cocoa powder, brown sugar, capers, balsamic vinegar, crushed red pepper, a pinch of salt, and process until fully incorporated - don't over process - a little chunky texture is what you're looking for. Top with ribbons of fresh mint in you have it, and serve with crackers or on top of toast.